How many points are there on the globe that by walking one mile South, one mile East, and one mile North, (in this precise sequence) you reach the point at which you started? 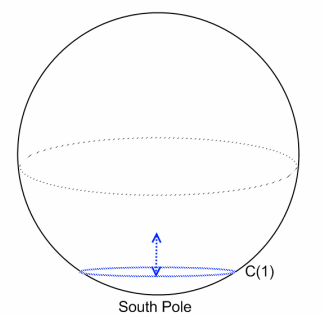 A common misconception is that there is only one point at which this is possible, the North Pole. But in fact, there are also an infinite amount of points that fit this description near the South Pole. By starting at a point one mile above the ring with a circumference of one mile near the South Pole, an infinite amount of points are possible. To help you visualize, imagine standing at a point and walking one mile South. The circumference of the Earth you reach after walking south is one mile. Walking one mile East will take you in a full circle back to where you started walking East. And finally, walking one mile North will bring you back to your original position. See an image of how this would look here.